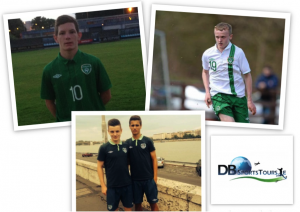 The Republic of Ireland U17’s secured two wins this week in the European Championship qualifiers with two DB Sports starlets getting on the score sheet. Ireland first swatted aside Gibraltar 5-0, then followed it up by an end-to-end 4-2 victory over the Faroe Islands. The Republic of Ireland U17’s started out their European Championship qualifying campaign with an imperious 5-0 win vs. Gibraltar at AthloneTown’s Lissywollen ground on Monday evening. Among the scorers were DB Sports stars Trevor Clarke – who scored twice – and Zachary Elbouzedi. The opening win of the campaign put Ireland in good stead going into their next game against the Faroe Islands who they faced on Wednesday evening at Galway’s TerrylandPark. An end-to-endgame ensued with goals flying in at both ends. In the end Ireland’s superior quality prevailed as they saw off the opposition with a 4-2 victory. Once again a DB Sports star was on the sheet as Trevor Clarke for the Boys in Green. Clarke was unlucky not to net earlier in the game only for some smart saves by the Gibraltar keeper. He was not to be denied though and finally scored in the 90th minute to add to the impressive win for the Republic of Ireland. Ireland’s next fixture is this Saturday vs. Scotland at LongfordTown’s City Calling Stadium. Kick off is at 7.30pm. For more information visit the FAI’s website.